MAG254 is a powerful Set-Top Box with efficient processor STiH207 and increased RAM memory, and it is an optimal solution for IPTV/OTT projects. The Set-Top Box is designed to fulfill business projects of internet providers, OTT operators and content aggregators. The increased productivity of MAG254/255 enables to use resource-intensive interactive applications and support 3D-video. STiH207 650Mhz, Linux 2.6.23, Composite AV, HDMI 1.4, USB x 2, S/PDIF, LAN, WiFi Ready. Ministra TV-platform, Netup, SmartLabs, Netris, Beenius. Audio output S/PDIF HDMI 1.4-output Composite + stereo A/V output Ethernet 100 Mb/s USB 2.0. PC and NAS in local network, Stream media protocols (RTSP, RTP, UDP, IGMP, HTTP), USB-devices. MPEG-1 layer I/II, MPEG-2 layer II, MPEG-2 layer III (mp3), Dolby Digital (optional). MP3, MPA, M4A, WMA (optional), Ogg, WAV. 1080i, 1080p, 720p, 576p, 480, PAL, NTSC. MKV, MPEG-TS, MPEG-PS, M2TS, VOB, AVI, MOV, MP4, ASF, QT, WMV. JPEG, PNG, BMP, GIF, RAW. MAG254/255 Set-Top Box, user manual, HDMI cable Power adapter 12V 1A, remote control, 2 AAA batteries, packaging. MAG254w1 Wi-Fi 802.11 b/g/n. 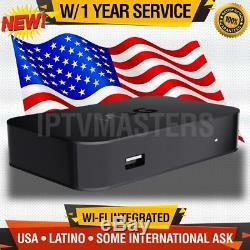 The item "Mag 254 w1 SET TOP BOX with12 MONTH IPTV SERVICE INCLUDED FAST SHIPPING USA DEALER" is in sale since Wednesday, May 16, 2018. This item is in the category "Consumer Electronics\TV, Video & Home Audio\Internet & Media Streamers". 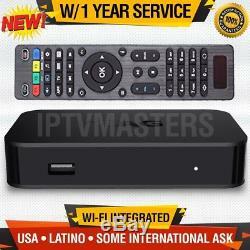 The seller is "iptvmasters" and is located in Miami, Florida. This item can be shipped to United States, Canada, United Kingdom, Denmark, Romania, Slovakia, Bulgaria, Czech republic, Finland, Hungary, Latvia, Lithuania, Malta, Estonia, Australia, Greece, Portugal, Cyprus, Slovenia, Japan, China, Sweden, South Korea, Indonesia, Taiwan, South africa, Thailand, Belgium, France, Hong Kong, Ireland, Netherlands, Poland, Spain, Italy, Germany, Austria, Israel, Mexico, New Zealand, Philippines, Singapore, Switzerland, Norway, Croatia, Brazil, Chile, Colombia, Antigua and barbuda, Aruba, Belize, Dominica, Grenada, Saint kitts and nevis, Saint lucia, Montserrat, Turks and caicos islands, Barbados, Bangladesh, Bermuda, Brunei darussalam, Bolivia, Ecuador, Egypt, French guiana, Guernsey, Gibraltar, Guadeloupe, Iceland, Jersey, Jordan, Cambodia, Cayman islands, Liechtenstein, Sri lanka, Luxembourg, Monaco, Macao, Martinique, Maldives, Nicaragua, Oman, Peru, Pakistan, Paraguay, Reunion.